Out of all the books we rounded up for our site beforetheywerefamous.org, there was one Creative Director whose portfolio we just couldn’t track down, no matter how hard we looked. But it did get us thinking about the kind of campaigns he might have had in it. Write a spec campaign that you imagine could have been in Don Draper’s first ever portfolio. 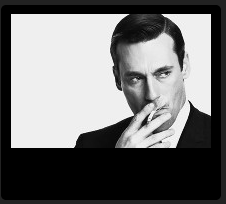 The best campaigns will be forever enshrined within Don Draper’s portfolio (along with links to the creative teams’ own portfolios), but the best campaign overall will also win a months placement at BMB London for the creative/creative team who wrote it. If you’d like to enter, please send scamps or designs to Nathalie.Turton@bmbagency.com by Friday 30th August 2013. Next Win a placement at BMB competition – Deadline extended till Monday.